Count your blessings, not what's missing. - Fr. Jerry Orbos, Midnight Mass Homily @ Christ the King. May your Christmas be filled with LIGHT, PEACE, and LOVE. Merry Christmas! 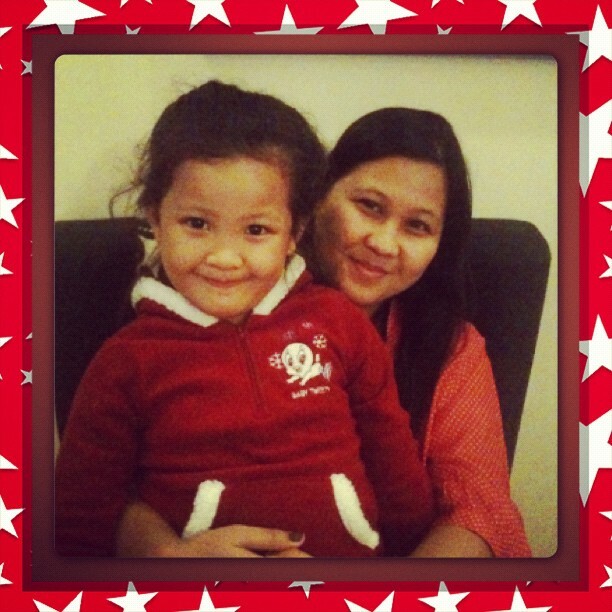 Wordless Wednesday: Merry "RED" Christmas! “Merry Christmas! Narito na ang siguradong patok na potluck na maipagmamalaki at maipagyayabang mo sa sarap"
Ang Frabelle Foods Premium Honey Glazed Ham ay gawa sa prime whole-muscle ham at pure honey, naturally smoked pa kaya naman real smokey-sarap ang lasa! 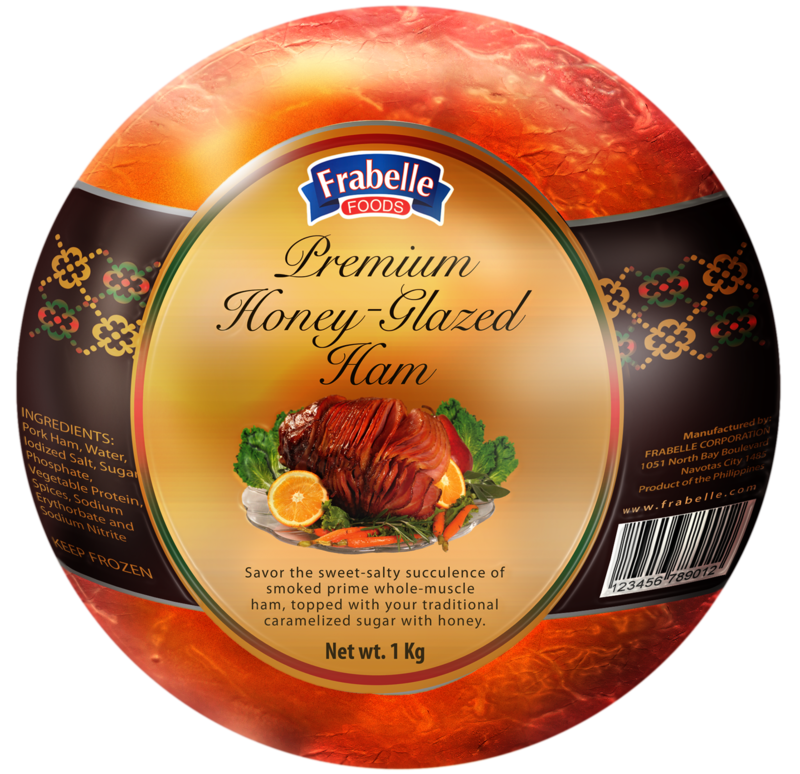 Frabelle Foods Premium Honey-Glazed Ham is prepared the classic/ traditional way to produce the tastiest, most succulent hams in the market. What makes it distinct from the hams we grew up buying in the market? 1. Naturally Smoked – Frabelle Foods Premium Honey Glazed Ham is smoked using real natural woodchips (instead artificial liquid smoke) that give the ham a distinct smoky aroma and taste all the way inside. Moreover, imported wood chips are used in a Smoking Machine. 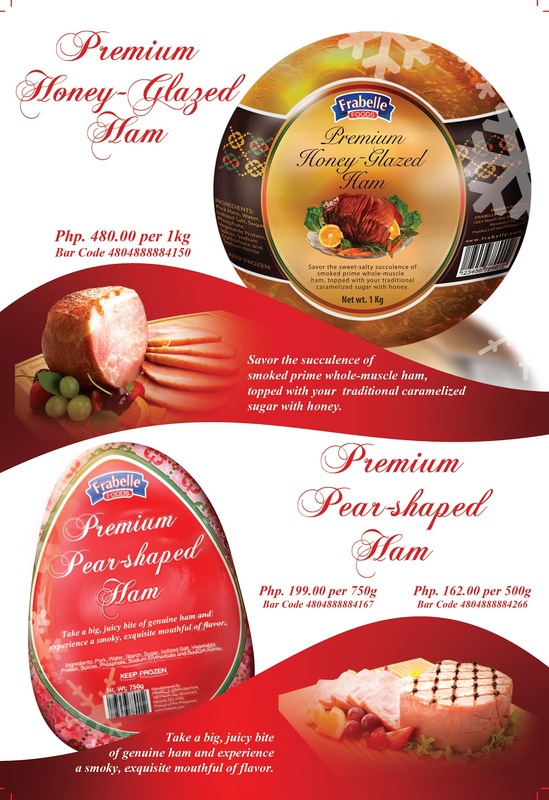 As you eat the ham, you can really savor the smoky taste combined with its sweetness and saltiness. I can say it has the ideal amount of flavor. My mom commented on how soft the meat is and how tasty it gets with every bite (obviously she enjoyed it!). 2. 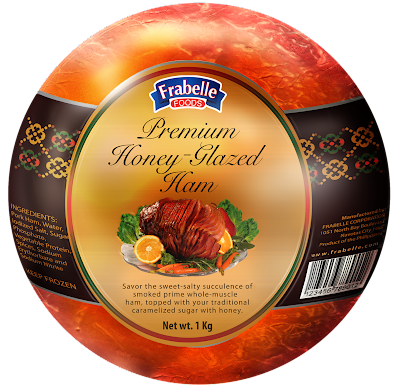 Caramelized to Perfection through sugar-glazing – Frabelle Foods Premium Honey Glazed Ham is topped with sugar and pure honey that is blow-torched to perfection, yielding a sweet succulent taste that enhances the meat. The hams we grew up with use jelly around the ham that usually separates upon preparation. They are individually glazed (with brown sugar) and blow-torched. This procedure of blow-torching the brown sugar on the ham makes the sweetness of the sugar mix in the natural saltiness of the ham - put together to get a full-flavored and tastier Honey-Glazed Ham. 3. 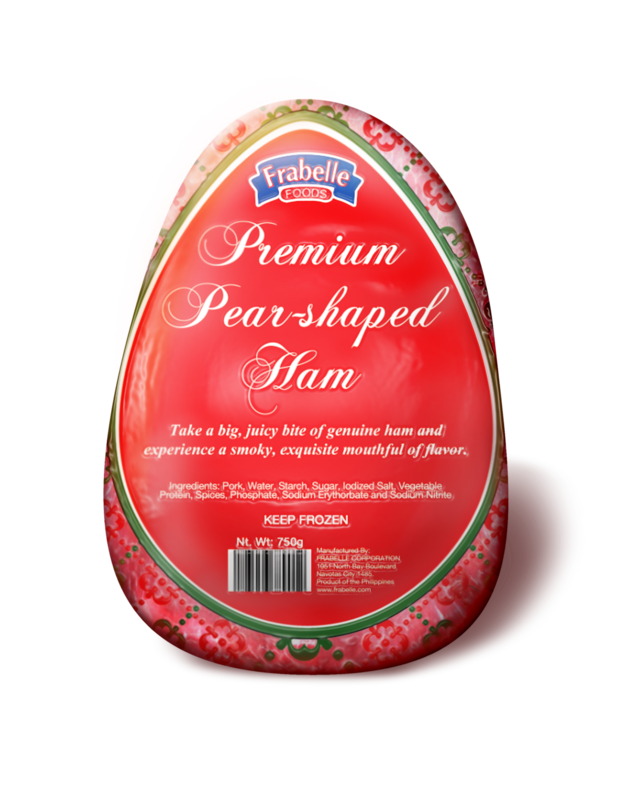 Use of prime whole-muscle ham – Frabelle Foods Premium Honey Glazed Ham is made of whole-muscle meat that comes from the ham-leg (imported from US) – the most premium and tender cut of the hog. The hams we grew up with use restructured meat by molding “retaso” meat together which separates or breaks upon cooking. As you slice the ham, you can see the whole and fresh meat (rosy color); also it has more meat than fat. It can be easily sliced with uniform thickness (as desired) without you worrying of breakage. 4. Gold Standard reflected in the packaging - The hams we grew up with don’t have a HAM SHOT in their packaging - imported from Greece. The pouch is a small stylish eco-bag perfect as gift this holiday season. It has a plastic covering at the bottom to prevent the bag from wetting if the ham is frozen. This is a very convenient way of handling the ham and it's eco-friendly! 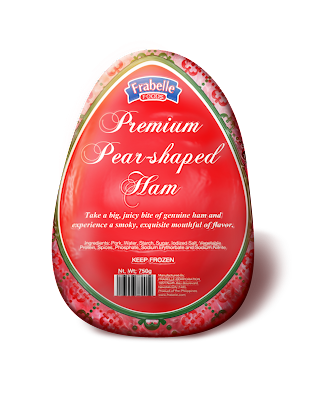 Frabelle Foods also have a Premium Pear Shaped Ham that is made of a unique blend of spices infused in the meat, giving it a tasty, juicy taste but at a more affordable price. We tried it at home and they loved it. Yes, we compared it to the ham we usually buy every Christmas and I can honestly say it exceeded our expectation. We were hesitant at first since it's a new product but it's really worth a try and worth the price. It smelled of smokiness as I sliced it and it really has a natural and rosy appearance. I used a non-stick pan for this and fried it until it turned slightly golden brown. 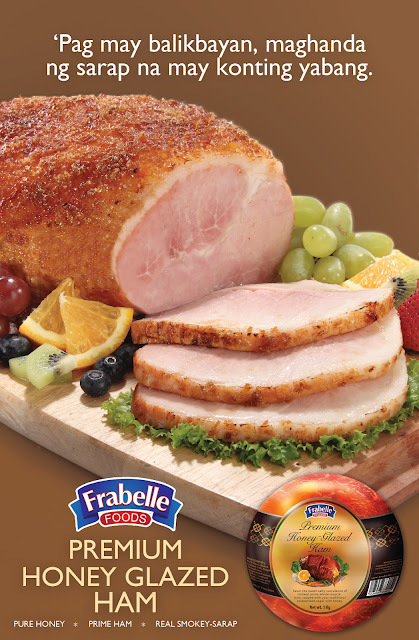 Try it to experience the Frabelle Foods Premium Honey Glazed Ham. Perfect for sharing this holiday season and as a gift for your loved-ones and friends. As in pwedeng ipagyabang! 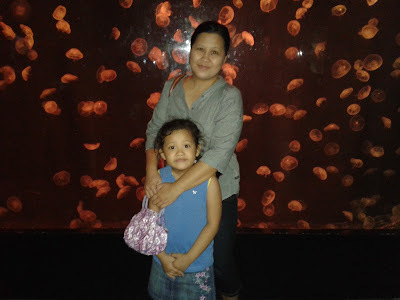 Visit their website to know more about their products here. For latest promotions, like them on Facebook. 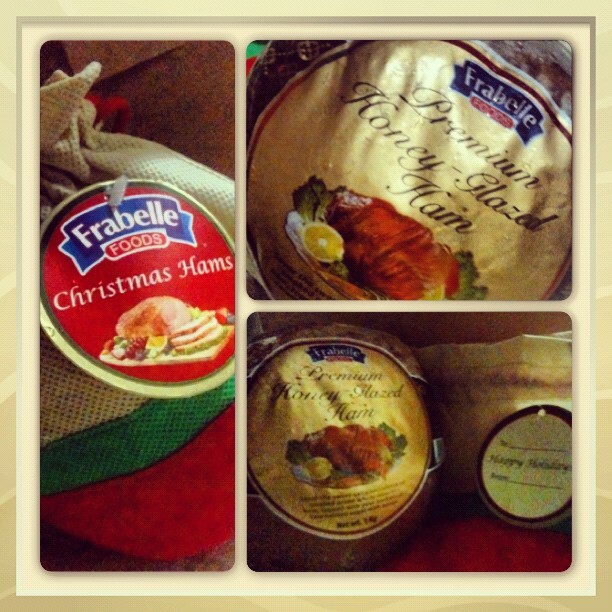 Frabelle Foods Premium Honey Glazed Ham: Sarap na may konting yabang! Finally! After the Moppets' in Motion (will make a separate post for this one), Meg's Christmas Party was held a while ago at school from 8:00 - 11:00 AM. I love events like this since I can be an OC Mom and a STAGE MOM once again. Haha wait for my post about her winning the 2nd place on her Poetry Presentation. Career mode talaga ko! I have many post backlogs and I decided to start with the latest "episode" which is her Christmas Party. I thought of giving the kids lollipops/candy canes from Candy Corner but when I went to the grocery, I saw this Lemon Square Whatta Tops Limited Edition Holiday Pack. It consists of six individually wrapped chocolate cupcakes topped with white chocolate and Christmas candy sprinkles. What I did was - I removed it in the box and put sticker on each cupcake. This costs ₱59.50 and for 4 boxes, I managed to give the 20 kids for almost ₱240.00 only. (good buy na diba) And the kids love it! 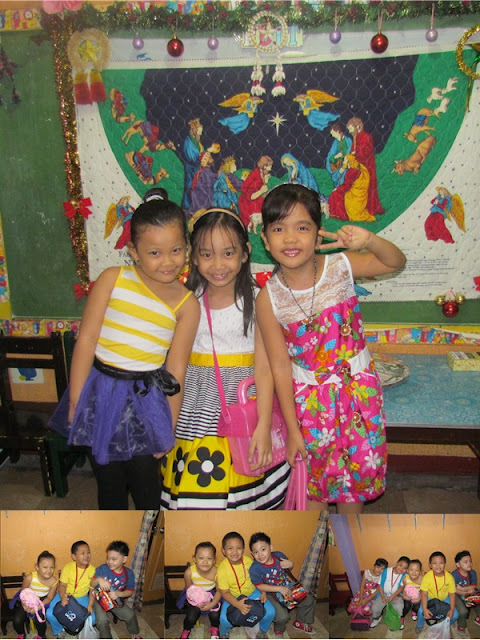 We were early for the party so I distributed the gifts to the teachers and school staff and take pictures. Now I can rest with all these school activities (for now). Merry Christmas everyone! My life will never be BLACK AND WHITE because of you.